Yorkshire will welcome four of their first-team squad who toured the Caribbean with England last month for their fourth LV County Championship match of the season against newly-promoted Hampshire at Headingley. While Gary Ballance and Joe Root remain unavailable (both deserve a break after a punishing international schedule over the last few months), Liam Plunkett, Adam Lyth, Jonny Bairstow and Adil Rashid all return to the White Rose set-up ahead of the encounter. Bairstow and Rashid were flown back to Yorkshire on a private jet after playing in England’s abandoned one-off ODI against Ireland in Malahide on Friday. From a Hampshire perspective, they will be boosted by the arrival of former West Indies seamer Fidel Edwards. They are without a win after three games in the top flight of county cricket this season, and they will be captained by James Vince as regular skipper Jimmy Adams will be attending the birth of his child. Vince was handed his ODI cap at Malahide and although he didn’t get to bat, he did claim his first international catch in the 18 overs that were possible. This game may be the sternest test of their season so far, and they will need senior players like Michael Carberry (who has a triple century against Yorkshire) to perform well. Grey skies are forecast, but little rain. Yorkshire’s international contingent will find conditions very different from the weather they enjoyed in the Caribbean, but there should be a full match. Of all their England absentees, the return of Liam Plunkett will be perhaps the most valuable to Yorkshire. Ryan Sidebottom’s injury has placed an even greater strain on Yorkshire’s bowlers, and 17-year-old Matthew Fisher started to look tired at the end of his two-match stint in the County Championship. He is currently taking exams which will rule him out of the next two fixtures, so Plunkett’s return is both a timely and exciting one for Yorkshire fans. Michael Carberry has an extraordinary average of 74.13 against the County Championship holders, including an unbeaten triple century at the Ageas Bowl in 2011. While he may be an outside contender for the spot of England Test opener vacated by the retirement of Jonathan Trott, the chance to prove he could still do a job for his country at the highest level will no doubt be on his mind. He averages 57.75 in first-class cricket this season, so he’ll be a prize scalp for Yorkshire’s bowlers. Yorkshire finally welcome four of their England absentees – Jonny Bairstow, Adil Rashid, Liam Plunkett and Adam Lyth – back into the Headingley fold. They have all been named in the 12-man squad at the expense of Richard Pyrah, James Middlebrook, Andrew Hodd and Matthew Fisher. Fisher has A Level exams that will rule him out of the next two games, and Middlebrook is not expected to play any further part in the season as he was only picked as cover for Rashid. Gary Ballance and Joe Root have a much-needed break and are unavailable, and Ryan Sidebottom is still out injured. 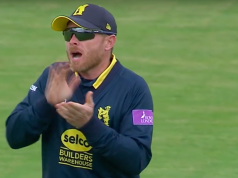 Hampshire lose their captain Jimmy Adams for this match, as he will be attending the birth of his second child. Wicketkeeper Adam Wheater faces a late injury test, while overseas signing Fidel Edwards will be making his debut for the county. Reserve wicketkeeper Lewis McManus and batsman Sean Terry have been called up to the squad as cover. Yorkshire squad: Andrew Gale (c), Jonny Bairstow, Jack Brooks, Tim Bresnan, Jack Leaning, Alex Lees, Adam Lyth, Steven Patterson, Liam Plunkett, Cheteshwar Pujara, Adil Rashid, Will Rhodes. Hampshire squad: James Vince (c), Andre Adams, Gareth Berg, Danny Briggs, Michael Carberry, Liam Dawson, Fidel Edwards, Sean Ervine, Lewis McManus, Sean Terry, James Tomlinson, Brad Wheal, Adam Wheater.